Reports From The Pharm: "...believe in yourself and allow yourself to succeed..."
"...believe in yourself and allow yourself to succeed..."
Krystal Pong, third-year UCSF School of Pharmacy student pharmacist, has won the 2010 American Pharmacists Association-Academy of Student Pharmacists (APhA-ASP) National Patient Counseling Competition, which was held March 15, 2010, at the annual APhA meeting in Washington, DC. 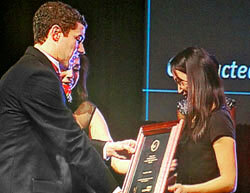 She won the California Patient Counseling Competition (February 2010), which qualified her to compete nationally. The national event was first held in 1984 with the goal of encouraging student pharmacists to become better patient educators. It is sponsored by CVS/Caremark in conjunction with the United States Public Health Service. UCSF Student Pharmacist Krystal Pong discusses her recent patient counseling competition with Susan Levings, UCSF School of Pharmacy Associate Dean of Planning and Communications. 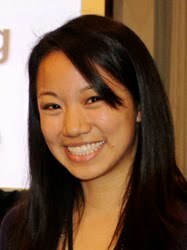 Krystal, congratulations on winning the 2010 National Patient Counseling Competition! How does it feel? I am ecstatic. I am so happy I was able to represent UCSF at the national level and hope this gets more students excited to participate next year because this was such an enriching experience for me. You won the California competition in February. What happened when you got to the nationals in Washington, DC? There were just over 100 other students representing their schools of pharmacy participating in the national competition. The first round was two days, and they announced the top 10 who were to compete again in a final round. We were given the patient's profile, the new prescription, and the chance to prepare for counseling with the patient on Septra for the first round, and Tricor for the second round. The patient was an actor who was careful to be consistent for all of the consultations. For the final round on Sunday, March 15 we were each given five minutes to prepare our consultation with access to references and five minutes to talk to the patient. During the preparation time, I outlined what I was going to say to the patient. Since we are given a list of the 10 possible drugs, I researched all of the drugs ahead of time so I could use the prep time to organize my thoughts and mentally prepare. Did you also prepare before heading to Washington? Before I left for Washington DC, I emailed everyone I knew who competed in the PCC (Patient Counseling Competition). Eric Ip, UCSF alum, won the national competition a few years ago and was kind enough to give me some advice, as well as Joy Meier, who mentored me over the summer and also won the national competition. And Troy Drysdale, Class of 2009, reviewed my consultations with me in detail and helped me find ways to improve my communication skills and gain confidence for the competition. I also practiced counseling on every drug--multiple times. And finally, I read and reread the words of encouragement I got from my friends, classmates, family, and faculty before I competed to give me inspiration. Describe the patient case you were given. The patient was a sweet older woman who was prescribed Tricor and currently taking Lipitor. Tricor is a fibrate and Lipitor is a statin, both lipid-lowering agents. She was confused about her cholesterol levels and why she had to be on an additional lipid-lowering drug. When I told her this medication was to help control her cholesterol she said, "But I thought my doctor said I have good cholesterol." So we took a few moments to discuss the difference between good and bad cholesterol. I also was sure to carefully go over the side effects with her because taking Tricor and Lipitor puts her at a higher risk of muscle pain and weakness. Unlike at the state competition, where we presented before a panel of judges, at nationals, I presented to the patient in a video room that simulated a pharmacy. There were bright lights and a video camera rolling and the judges review the tapes afterwards. In some ways, the scenario felt very real because I got the patient profile, the prescription, and a realistic patient. I was very nervous before we started, but when the patient and I began talking it felt more like a real consultation than a competition. During this whole process from the state to the national competition what was the one thing that stands out most vividly? Actually, two things stand out to me: One, I learned how supportive the UCSF community is--faculty, staff, my classmates, and friends--they were all tremendously kind and supportive. And two, I learned how important it is to not be your "own worst enemy" by having a self-defeating attitude, but to instead believe in yourself and allow yourself to succeed. I will carry this lesson with me throughout the rest of my life. Will this blog post fulfill your requirement?